With the latest Jonah Bank Mobile App, and our Online Banking System, we are providing you with a familiar and unified user experience. With all the features you need in our mobile app, it's like having your bank in your pocket wherever you are. The Jonah Bank Mobile App is available on iOS® and Android®. Jonah Bank's Mobile Apps are fast, free and available to all Jonah Bank of Wyoming customers in the Apple App Store and Google Play Store. That’s it! You now have your bank in the palm of your hand! Avoid connecting to unknown wireless networks. These networks could be rogue access points that capture information passed between your device and a legitimate server. * While Jonah Bank does not charge for Text Banking, your cellular phone carrier may charge per SMS message sent and received. You must contact your cellular phone carrier for details regarding any fees they may charge. Cancel Text Banking immediately by calling customer service at 1-866-504-5111. Or you can sign in to Online Banking and navigate toSettings > Text Enrollment > Turn off Text Enrollment, and delete your cell phone number, then click/tap on save. If you find your mobile device later, you can re-enroll that same mobile number. You may receive more than 1 message if the message is longer than 160 characters (the limit for our text messages). For a transaction history inquiry, the response may require multiple messages. Sign in to Online Banking and go to Settings > Text Enrollment > Edit Number to change your mobile number. Texting STOP from your cell phone device will stop all Text Banking Commands on your device. To re-enable text banking you will need to set it up again from within online banking, and issue the "START" command from your device. For assistance with our Mobile and Text Banking systems you can contact us anytime. To get started with Card Valet® download the app from the respective Apple or Android store today. We get it, paying to access your money doesn't feel right, that's why we joined the MoneyPass® network, so you get access to over 32,000 surcharge-free ATMs nationwide. 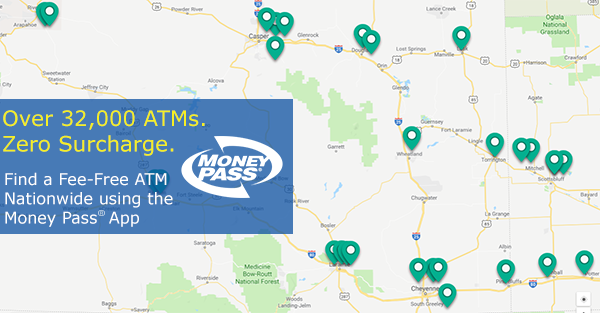 Wherever you roam, you can find a surcharge-free ATM by going to www.moneypass.com, using the link under services in online/mobile banking or downloading the free MoneyPass® App from the appropriate App store. What are you waiting for? Start using surcharge free ATMs today!